Shakespeare's Sonnets is the title of a collection of 154 sonnets written by William Shakespeare. The collection was first published in 1609 by Thomas Thorpe. 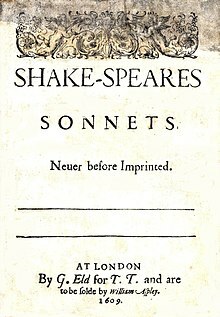 In general, each sonnet is in iambic pentameter, and consists of three quatrains followed by a concluding couplet. The sonnets are about love, death, jealousy, procreation, beauty, etc. This page was last changed on 20 July 2017, at 16:29.